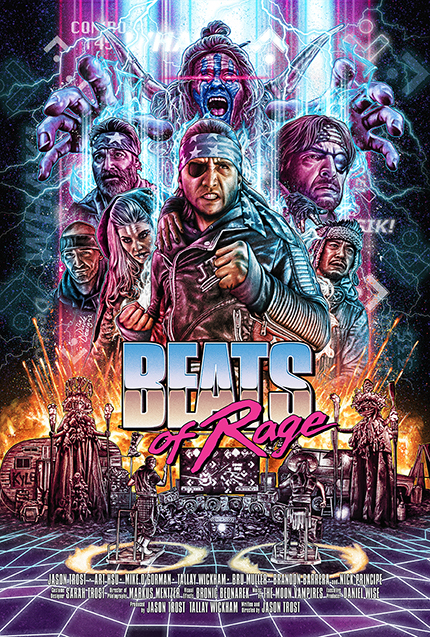 Jasont Trost's FP2: Beats of Rage, the sequel to his 2011 cult hit The FP will have it's world premiere at Fantastic Fest on Saturday September 22nd at Midnight. The benvolent Mr. Trost has asked us to share a clip with you from his upcoming film. You may step to the beat down below. Despite hanging up his boots following the events of The FP, JTRO must return to the blood sport of Beat-Beat Revelation one last time. JTRO and KCDC – his mystical hype man – will quest deep into The Wastes, a land decimated by the Beat Wars, to compete in the ancient Beat-Beat tournament, “Beats of Rage,” face AK-47 – and, hopefully, save their world. Seeing as no one has seen Beats of Rage just yet we cannot comment on where in the story this clip takes place. But we find JTRO (Trost) ten years after the events of The FP and he has been called to war. So he amps up his Beat-Beat Revelation game once again, turning it up to three-hundred and seventy-five, and prepares for battle in The Wastes. It is a throwback of sorts to the old school montages, mixing in shots with JTRO's older brother BTRO from the first film. From the looks of things JTRO has not... missed a step.